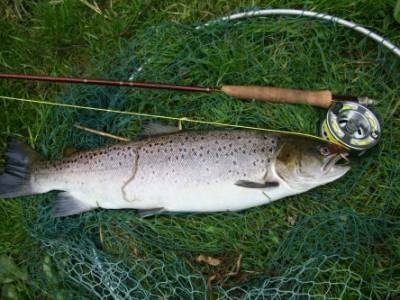 Fly fishing for salmon and sea trout on the river Test. 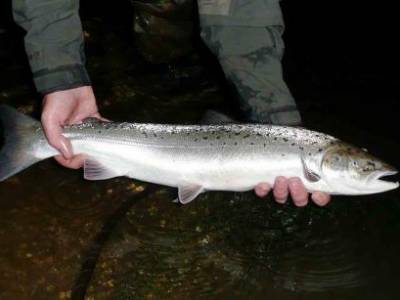 In the last four weeks the fishery has accounted for nearly 20 double figure salmon and several in single digits. The largest this 43" fish, with a conservative estimate of 27.5 pounds, taken on a fly by Mr Steve Turner. Salmon and sea trout in a Hampshire chalk stream. Like most reading this I live and breathe fly fishing. I love the diversity of the sport, the myriad species one can target, the countries one visits and the adventures and friendships these pursuits bring. When introducing newcomers to the sport I over quote the “Trout only live in beautiful places" line whilst trying to get my enthusiasm to rub off. After over 30 years of chasing fish with fly I still enjoy pretty much all that the sport can cast at me. I get as much of a buzz when I trigger that look of terror and excitement on the face of a student as they hook their first trout on a dry fly. Nowdays, this middle aged ‘troutgrump’ craves new challenges himself, something different when he goes fishing, perhaps something a little bit quirky or against the grain. Fulfilling these urges usually involves writing hefty cheques, a couple of flights, a hard seat in a boat chugging diesel fumes in my face and an entomology lesson in insects that eat me rather than the fish eating them! For English fishing, I’m spoilt, I know. As a chalk stream guide I have trout fished on most beats Wessex has to offer. And, of all my fish-‘sploits, my all time number one will always be the red spotted wild trout of the river Test’s little sister, the beautiful Dever as she comes alive during an evening hatch of olives. But what about when I need to stray out of my trout fishing comfort zone? When I crave a fix of something different. Where do I head without breaking out the passport and vaccination records? There is a secret place in my home river, a hour or so from London, that offers world class sport. Here the targets are the two migratory cousins of my usual brown backed quarry….. 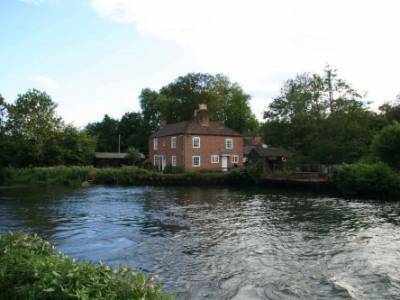 Although the river Test is one of the world’s most famous fly fishing rivers, one doesn’t really associate this hallowed chalk stream with salmon or sea trout fishing. At first thought one thinks of dry flies cast up stream and fat mayfly slurping brown trout finning lazily over rannuculus lined gravel runs. However, well into the close of the trout season and after the retreat of most fly anglers, both species of migratory salmonids have the carnal urge to run the river’s chalk filtered water, passing ocean liners in Southampton’s docks, to seek out tributaries and backwaters in which to spawn. 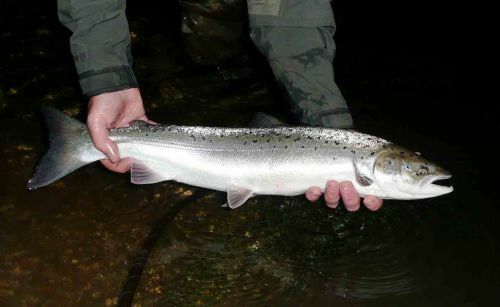 Both salmon and sea trout pre-empt spawning by months and move from salt into freshwater lies in the river’s lower reaches from spring onwards. 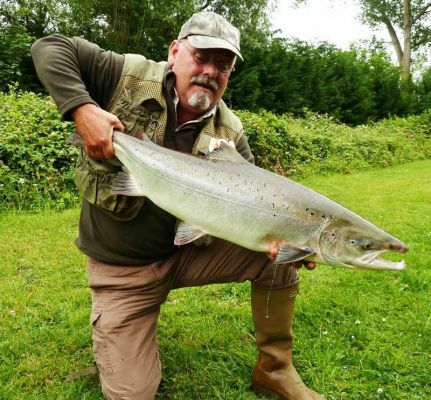 It is at this time that they offer the intrepid fly fisher a unique and very visual experience; the chance to catch a salmon or sea trout from crystal waters of a Wessex chalk stream. This is absolutely a must ‘box to tick’ for any serious fly fisher. The two legendary beats at the bottom of this river offer a riparian oasis bounded by Southampton’s sub-urban sprawl. Testwood Pool and the ‘Little River’ at Nursling. Both beats are fished during daylight hours for salmon and sea trout and Testwood Pool is also fished at night for sea trout. The salmon fishing really is unique. 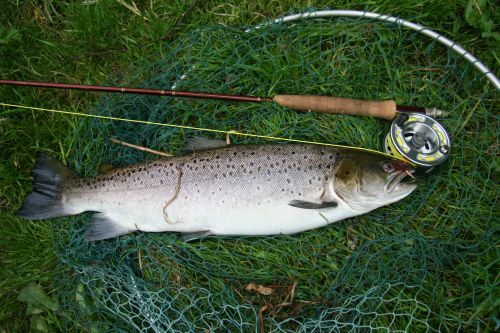 Far from casting a Spey line with a traditional double handed salmon rod; at Testwood the preferred method is to roll cast a heavy salmon nymph using a single handed trout rod. The nymph is allowed to sink, usually by following the cast with a couple of slack line mends. Once the fly is near bottom, the rod is slowly lifted so as to raise the nymph to the surface. Most salmon fishers are well aware that salmon have a tendency, for whatever reason, to follow a rising fly. Sometimes they will slash at it aggressively, others they will inhale it gently, but more often than not they will follow and turn away at the last moment. -Often exasperating, but always exhilarating. Where else can you watch the salmon follow your fly, turn and flip you a tail in disgust? Or if lady luck shines, take your fly and enjoy the ensuing battle on a single handed 5 weight? Fishing for salmon here has taught me a great deal about the behaviour of the fish and how they react to not only the fly, but also to a poor cast or a shadow thrown by a human over their lie. I have often thought about these observations whilst salmon fishing in Scotland or sea-trouting in Wales where one is unable to see the fish easily. 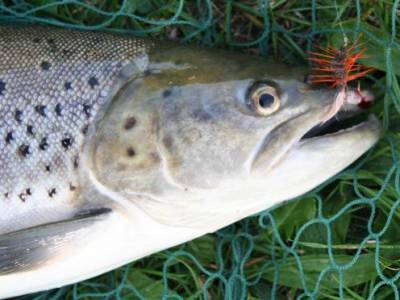 Is my fly followed and rejected as often as I fish through a pool on the Spey or Cothi? Almost certainly. I have listened to guides in Iceland say that stripping a Sunray over a pool can sometimes kill the pool and put the fish ‘down’. At Testwood, I have watched this firsthand. A noisy angler looming over the edge of the pool in full view of the fish. The salmon and sea trout slowly sink away until their bellies are hard on the gravel bottom. There they stay in a sluggish stupor sometimes for hours and even into the following day if the disturbance was intense. Some things really bother salmon, whilst others seem not to. The river keeper recounted how he watched salmon react to a worm baited hook in the old days. “They would be really aggressive", he said, “often blowing the worm three feet up the line as they grabbed it and spat it out. A worm played havoc with the pool, whereas, a shrimp could be bounced all around them and it wouldn’t bother them in the slightest". Stealth tactics are just as important salmon or sea trout fishing as they are when tempting a wild brown trout to take a dry fly on the river’s most upstream reaches. If the fish sees the fly without seeing you there is a good chance it will be taken, especially the first time he sees it. As a guide on the trout beats I frequently plead for extra concentration as we stalk a rising fish – “make the first cast count". Sea trout fishing in Wales I’ve watched anglers wade right into the pool to fish only to wonder why they don’t catch. Rivercraft is essential too. Watching how the fly behaves in the clear water is very interesting. How it moves through boils, back eddies and undercurrents beneath the surface. Here one can also see this fishes reactions to the fly. Usually the salmon fisher only has the clues the water’s surface gives him. Observations here may be extrapolated to other rivers visually demonstrating what an upstream mend or a much squarer cast will do to your fly. 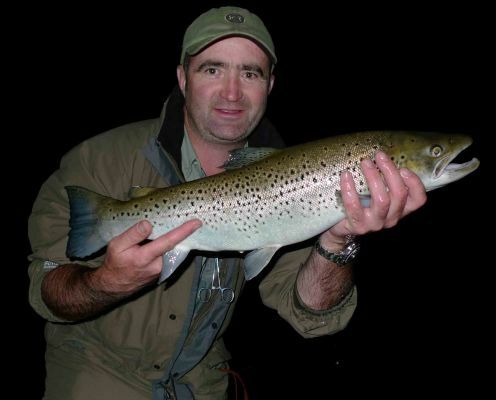 I also use this knowledge when fishing the same pool for sea trout at night. Slow the fly down as it passes a certain point on the swing and ‘bang’ a crunching take is the reward. Each take over the years gives the angler a psychological map of the pool and in the hours of darkness when one’s other senses are honed, I flick through the pages of my map, trying all my tricks. The cast goes whizzing out without the line catching on the Himalayan balsam. I feel the line draw taught as the fly swings gently in the flow. “Fishing nicely" I whisper to myself, whilst willing the most exciting second in fly fishing to occur – that concentration shattering take of a sea trout at night.